Illegal tobacco is a problem that enables local children to smoke, brings crime into communities and undermines local shops. As a retailer, if you’re angry about it, you are right to be annoyed – and you can help. 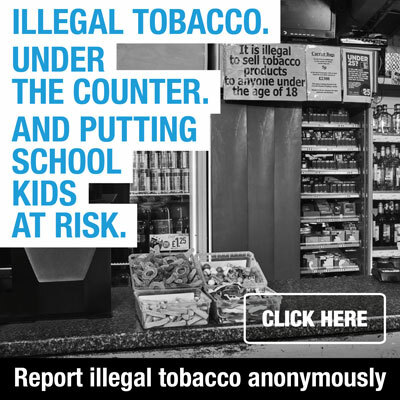 While most shops do not sell illegal tobacco, and would not dream of selling to children, figures do show shops have become a source for illegal tobacco sales, with a small minority of traders prepared to break the law. Surveys show about 24% of illegal tobacco sold in the North East is bought from shops. Tobacco companies have claimed the illegal tobacco market is out of control. However, although it is still a problem in some areas, the illegal tobacco market as a proportion of the overall tobacco market has almost halved since 2000. In 2016 HMRC figures show illegal tobacco made up 13% of all cigarettes and 32% of hand rolled tobacco, compared to illegal tobacco making up 21% of all cigarettes in 2001 and 60% of hand rolled tobacco in 2005-06. How illegal tobacco harms communities. It bypasses the “Over 18” law which most honest retailers abide by, making it easier for children to get hold of cigarettes. Children are often aware who is selling it locally and at pocket money prices. 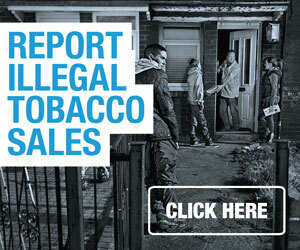 The illegal tobacco trade is linked to criminals and brings crime into local areas. People supplying it locally are often involved in drugs or loan sharking. Cheap tobacco encourages smokers to keep smoking and to smoke more, and can break down their willpower to quit. Cigarette packs and hand-rolling tobacco packs must be supplied in line with Standard Packaging of Tobacco Products Regulations 2015 and Tobacco and Related Products Regulations 2016. The sale of illicit tobacco contravenes the Tobacco Products Duties Act 1979. Counterfeit tobacco products also contravene the Trade Marks Act 1994. Illicit tobacco products may also contravene labelling requirements. It is an offence to sell tobacco products to anyone under the age of 18. It is also an offence for an adult to buy tobacco on behalf of someone under 18. The sale of loose cigarettes is illegal. The minimum pack size contains 20 cigarettes. All retailers of tobacco products are required to display a statutory notice visible at the point of sale. People travelling to the UK can bring in a limited amount of tobacco products from other countries only for their own personal use. Possession is legal; re-sale is illegal. Tobacco purchased over the internet must have the UK duty accounted for before the products are sent to the UK. There is a distinction between possession of a non-compliant product for supply (an offence under Trade Marks Act and Tobacco and Related Products Regulations which is treated the same as selling) and possession for personal use which is not an offence. What are the penalties for selling illegal tobacco? A hefty fine or up to two years imprisonment for breaching Standard Packaging of Tobacco Products Regulations 2015 or Tobacco and Related Products Regulations 2016. Up to £5,000 fine for sale of tobacco without a fiscal mark. Up to £2,500 fine for selling tobacco to under 18s: Repeat offenders risk a restricted premises order, a restricted sales order or both. Breaching these can mean a fine of up to £20,000. How can I keep my business safe? report any intelligence you have about where illegal tobacco is being sold by calling 0300 999 0000, visiting the reporting page on this site or by contacting your local Trading Standards department.